Kerbals and Asteroids: What could possibly go wrong? Good news, Kerbal Space Program rocket scientists! 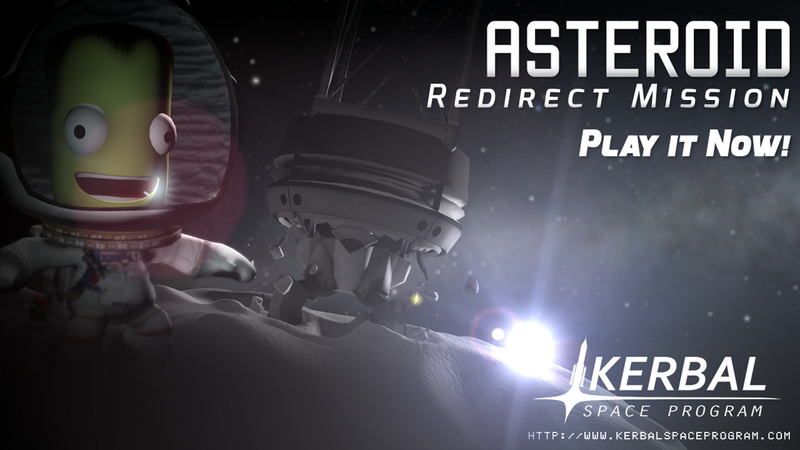 The Asteroid Redirect Mission is now live, available via the patcher. I won't get a chance to play with it for a few days, but chime in with your experiences in hunting mysterious orbital objects. Who wouldn't be happy adrift in space near a spikey satellite and a very large rock? Screenshot via NASA. Asteroids! Countless objects now share planet Kerbin's orbit. Some will pass by harmlessly, others will crash into the planet if you don't stop them. The uniquely-generated objects range in size from a few meters to far more gigantic. Of course sample return missions will earn you precious, precious science. Object Discovery & Tracking: Just where are these asteroids? You'll need to observe them through the Tracking Station Facility, and, like with NASA's Near Earth Objects program, the longer you track the better you can predict their orbits. And if you don't track them? You might lose that space-rock in orbit, a potentially unnerving situation. The Claw: A new part to grab asteroids, Kerbals, or just about anything else you find drifting in space. Finally, a way to rescue that poor kerbalnaut drifting in endless space on a rocket from before you invented hatches! Really Big Engines: because the answer is always bigger rockets, right? Better Joints: the mechanics of how parts attach to each other has been updated to be more accurate, flexible, and stable. Usability Tweaks: polishing up older features, fixing little things that didn't get fixed before, blah blah blah that will hopefully make the process of sending Kerbals into the vast unknown a little easier. Lonely Kerbal, contemplating the Kerbin from a vantage point. Screenshot via NASA. All screenshots of the Kerbal Space Program. Read more on the developer blog or the press release. Want some real-life aerospace history? JPL has a long history of exploding things, while the cast of Stark Trek helped NASA recruit astronauts.